for a quick catch up on his favorite bands and how he came up with the idea. Where do you live? What do you do when not making awesome Tumblrs? I live in Jakarta, Indonesia. I'm an art director at an advertising agency. I first saw the Ikea Monkey, especially the photo with the monkey looking outside from the window, my first thought was "omg, that sums up my life, looking at the outside, flat face, like waiting for something that never come". Maybe the monkey thinking she was in the video clip or something. Then realized, I remember some emo bands album have a deep title, deep cover album. 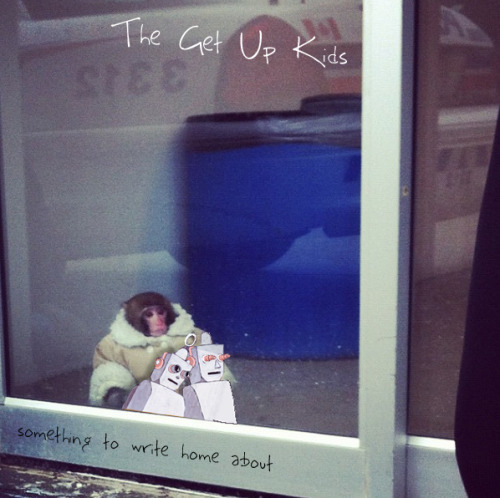 I was listening to Snowing, (that's why it's the first photo in the tumblog), and then "that's it.. the songs and the monkey, represented what emo is". When did you start to feel this was taking off? What are some of your favorite bands from this era? There are many. But for emo bands, I like Empire! Empire!, Dads, TWIABP, and Deer Leap. Favorite posts so far from the blog? Mineral did this to me when i was senior high school, eventhough i already listen to Rites of Spring in Junior High School. Favorite reunions of the last few years for you? Any obscure songs/bands you like that people should know about?